What does the most expensive townhouse in the trendy Brooklyn neighborhood of Williamsburg look like? We have the answer. The Oosten is a new block-long luxury building and home to one of the neighborhood's most expensive properties. The top floor property is a multi-million dollar home with views to boot, looking out onto the Williamsburg bridge. Designed by acclaimed Dutch architect Piet Boon with architecture by Think! Architecture, the penthouse is a 5,098 square foot duplex featuring jaw-dropping designer elements. 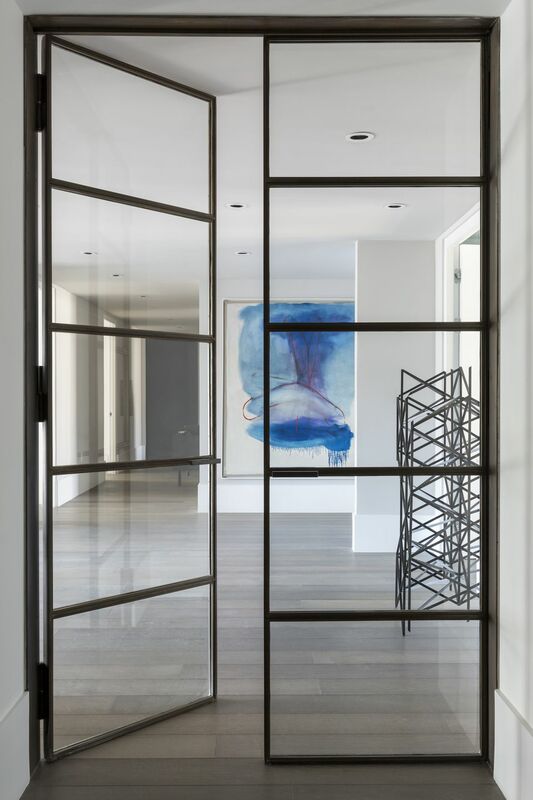 Toronto-based boutique design studio, Abraham Chan, designed the beautiful residence that boasts five bedrooms with en-suite baths, along with river, bridge and Manhattan views. Chan is known for his functional and modern design aesthetic and it shows in this impressive high-rise interior. Pieces have been chosen that focus on form, function as well as clean lines that fit with the home's modern layout. In the living area a gray sectional that can easily seat ten is combined with modern seating and hand-constructed benches from India. In a duplex that is over 5,000 square feet, space is not hard to find in this interior. The large living area looks openly onto a built-in bar perfect for entertaining. Beyond it, a small bistro area has been carved out for a place to sit, eat and host guests. Beyond the living area, up the stairs, you walk into a spacious kitchen that is located on the top-floor of the home. Featuring a mix of custom millwork, black marble and strong metallic details, the kitchen is a thoroughly modern space. The open plan kitchen area goes into the home's dining area. The dining room is large-scale and impressive. A reclaimed wood table is large enough to seat ten guests comfortably. To highlight the size of the table, two oversized chandeliers add ambient light overhead. To complete the dining room, a large piece of art anchors the dining space. The dining room looks onto one of this home's many outdoor areas, allowing a fusion of indoor and outdoor dining to happen anytime of year. The bedroom has views right out to the Williamsburg bridge. With cool steel meeting the eyes each morning, the design team was sure to create a bedroom retreat that is calm and comforting. The cool blue shade on the bedroom walls extends to the ceiling as well, creating a warm, enveloping space. Cool oak floors also feature a blue area rug that matches the room's blue shade. To break up the color block, a large hardwood bed dominates the space. A triptych of black and white art above the bed also creates a break in the color scheme. The bedroom retreat is completed by an ensuite lounge that is cool and cozy with neutral tones. The cool blue from the bedroom extends into the home office. Here, the home's theme of warm woods and cool neutrals does the trick again. A wood bookshelf offers ample storage in the office. A large desk area provides plenty of room for work. And white chairs bring in a neutral base to help break up the blue shade in the office area. Every bedroom in this modern penthouse has an ensuite bathroom. This bathroom is beautifully modern in its design. Mirrors hang down and layer over the vanity in a way that's unexpected and fun. While the mirrors are outlined in black, everything else in the bathroom is white and oak, allowing for contrast. The space offers ample room for two people to get ready at the double bathroom sink. The home features two terraces, one which faces outward and the other that opens onto a courtyard facing terrace with a hot tub. Extending from the dining area on the top floor, the first terrace has wood seating that warms up the concrete and metal that makes up much of the outdoor design. Stairs to the hot tub also double as extra seating for when guests are over. Unquestionably modern, Boon's style boasts a classical touch that is evidenced by his affinity for pure, organic materials and a subdued palette. All of these elements and more make up a modern penthouse that looks out and over Williamsburg.